Where? Comfort Suites Baymeadows, 8277 Western Way Circle, Jacksonville, FL, 32256. 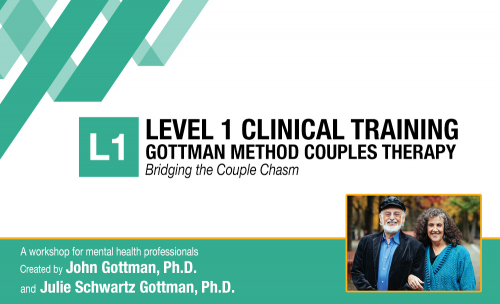 This is the first step in learning Gottman Method Therapy! A truly inspiring workshop, Level 1 training will give you new insight into couples’ struggles using proven assessment techniques and intervention strategies. You will be introduced to Dr. Gottman’s breakthrough research on thousands of couples to understand the difference between the “Masters” and “Disasters” of relationships. If you are not already doing an assessment, this training will teach you how to assess a relationship’s strengths and areas of concern using empirically validated questionnaires. Conduct a couple’s therapy assessment using elements of the couple’s narrative, the Oral History Interview, written questionnaires, observations of conflict, and individual interviews. Describe the Philosophy of Therapy, including assumptions, an overview of techniques, and goals of therapy. Credit requirements and approvals vary per state board regulations. Please save the course outline, the certificate of completion you receive from the activity and contact your state board or organization to determine specific filing requirements. PESI, Inc., Provider #1062, is approved as a provider for continuing education by the Association of Social Work Boards (ASWB), www.aswb.org through the Approved Continuing Education (ACE) Program. PESI, Inc. maintains responsibility for the program. ASWB Approval Period: January 27, 2017-January 27, 2020. Social workers should contact their regulatory board to determine course approval. Social workers will receive 12 clinical continuing education clock hours in participating in this intermediate course. A certificate of attendance will be awarded at the end of the program to social workers who complete the program evaluation. PESI, Inc. is approved by the American Psychological Association to sponsor continuing education for psychologists. PESI, Inc. maintains responsibility for this program and its content. PESI, Inc. is offering this activity for 12 hours of continuing education credit. Full attendance is required; no partial credits will be offered for partial attendance. This seminar qualifies for 12 continuing education clock hours as required by many national, state and local licensing boards and professional organizations. Save your course outline and certificate of completion, and contact your own board or organization for specific requirements.